As humans, we will never understand the depth of God’s love, mercy and forgiveness. The bible itself talks about a multitude of people in heaven from every place, race, tribe and language. It begs the question whether heaven is for all religions or only a select few. In my novel, Life in Harmony, the topic of heaven and what its like is addressed in-depth. My personal view of what heaven will be like is very much represented in the book. I based my idea of heaven on my own interpretations of scripture to support my claim (something I think we all should do). In Harmony, Kate’s dealing with both the loss of her baby and mother. She’s struggling with losing people on opposite ends of the spectrum of her life and it’s an important dynamic. In one relationship she’s the daughter and in the other the potential mother (this dynamic is a central point in the story). The truth is I don’t think heaven is a physical place at all. Heaven’s not up in the sky like so many think. It’s a place of mind. It knows no boundary. I believe a soul is at peace once it arrives in heaven. It does not wander or wonder. It knows. And when we die, our soul goes to that place of peace. The soul is in harmony with the spiritual realm and all its elements. Void of time, pain and distance. It’s unlike anything we could imagine…heaven is hard for anyone to easily describe…While heaven is beyond us and it is still a part of us. What Ruth is talking about in the end of that passage is the fact here on earth we catch glimpses of heaven. In the form of God’s majestic creation, in our soulful connections to other people and in the miracles He brings to our lives. I want the reader to understand we have human limitations to understand what God and heaven are. We can never truly know just how great heaven is. At the same time, we still have these spiritual connections to both God and paradise. 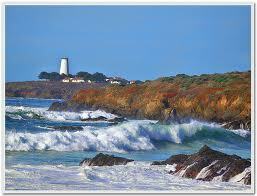 In the novel, I set the story along California’s Central Coast in the real life coastal town of Harmony, California. For me, personally, California’s Central Coast is as close to heaven as I get. It’s my “place of mind,” my little piece of heaven here on earth. I believe heaven will be different for everyone. What I see and experience will be different from what you will experience. I will find a beach more perfect that can be found here on earth. For a glimpse of the Central Coast and my view of heaven, I’ve included a photo by Dagmar Collins from Flickr.com of the Piedras Blancas Lighthouse on the Central Coast. The lighthouse (and the legend I created for it in the book ) plays a significant part in the story. It’s a part of the story that reaffirms the harmony with the heavenly realm we experience here on earth and what heaven is to each of us. What do you see when you visualize what heaven is for you? Who will be in heaven? Share your views below. Thanks for reading and sharing.